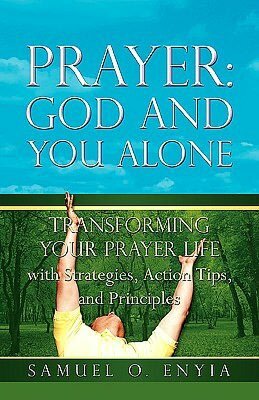 Prayer: God And You Alone is a powerful book that will help you to transform your prayer life using strategies, action tips and powerful principles. Filled with wisdom, scripture and solid foundations for teaching, this is a must read book for every believer that desires a closer and more intimate relationship and prayer life with God. With such chapters as What About Prayer, Know God's Creative Will, Pray The Will of God, Pray and Wait, Pray With Self Discipline, Time Alone with God, Know the Word Factor and many other life changing chapters, the author has compiled a wonderful book filled with practices that will help you to dig into the very depths of the heart of God and prayer. More than just a book to be read, Prayer: God And You Alone is also a wonderful study book that places important questions on the table and allows the reader to participate in the answers. Filled with the solid foundations of scripture the author has woven together a wonderful book on prayer that provides the reader with the tools for a successful prayer life and the blessings that come through prayer. With a total of 16 chapters and 226 pages be prepared to be both taught and challenged to apply strategies and principles that when put into action will ignite your prayer life. This is a highly recommended read for Christians of all walks, regardless of whether they are a new believer or a mature believer. There are nuggets to be found within the pages of this book for everyone. This book is also a very powerful ministry tool to share the love of Christ, Kingdom principles, the Word of God and encouragement with others.